In an increasingly challenging digital environment that demands brands to empower individual consumer needs, Marketers are constantly looking for new opportunities to interact with their customers and deliver meaningful and highly engaging customer experiences. With these efforts, a lot of confusion arises when trying to understand the relationships between data, customer segmentation and personalization. This article aims at discussing the role of each of these elements, and the challenges that need to be addressed to achieve a winning customer experience. Discover how to build actionable segments and deliver optimized and personalized experiences that drive higher revenues and engagement. Let us start by demystifying a common myth: Visitor segmentation does not mean the same thing as personalization. Segmentation represents the process of discovering groups of individuals with a common, yet broad, set of characteristics, such as a geographic location, IP address, interests, time of visit, etc. Personalization on the other hand, is segmentation stripped to its roots. It’s about tailoring highly relevant content at the most personal individual level. Real personalization enables Marketers to focus on the things that matter most to their individual customers. So that, instead of focusing on generic correlations between groups, Marketers can tailor individual experiences and respond directly to their customers’ ever-changing needs in real-time. Personalization is segmentation stripped to its roots. Traditionally, a good example of partitioning customer bases into segments would be grouping customers into clusters by combining the transactional data of customers with similar characteristics. This segment can then be used to analyze the behavior of these customers, or serve them with relevant content based on their needs and interests. With real personalization, a product purchase history can be used to personalize an individual customer experience. This objective can be realized using a personalized recommendation widget (like the one we offer at Dynamic Yield) so that each individual customer sees completely different offers, tailored to his or her needs. Segmentation models suffer from high levels of aggregated heterogeneity, and are generalized to all group members, while personalization models usually suffer from a scarcity of data for individual customers. 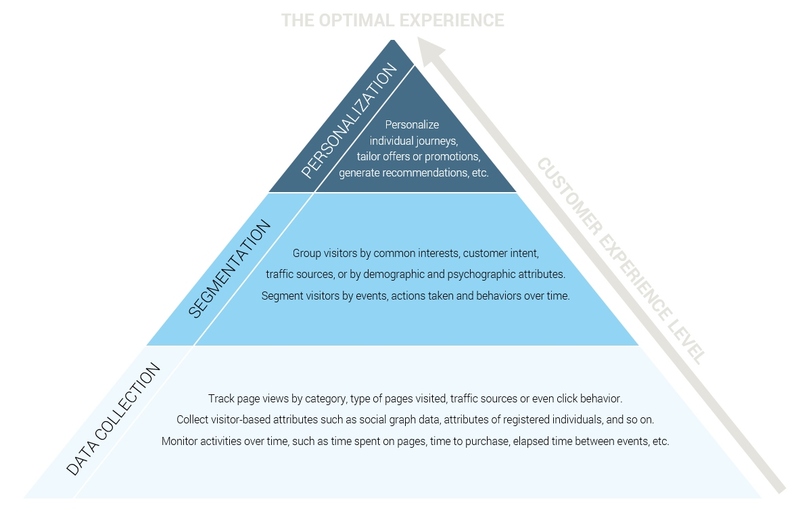 The Pyramid Base: Data Collection – The key to both segmenting and personalizing experiences is having robust customer data. The richer your data, the better the understanding of your audience, and the better you can segment and personalize experiences based on that data. The Mid-level: Segmentation – Once you’ve collected enough valuable data, you can start analyzing it, looking for interesting correlations between groups. The Top Level: Personalization – Real-time, one-to-one personalization can only be achieved if you have enough data, and if you know who your audience is and what your most valuable segments are. Share The Pyramid of Personalized Experiences on Twitter! With the right technology in hand, it’s only a matter of following the right path to achieve the ultimate goal of delivering a seamless, one-to-one customer experience. Orchestrate your marketing strategy wisely and you’ll be able to serve customers and prospects more effectively across all your inbound, outbound and real-time channels. 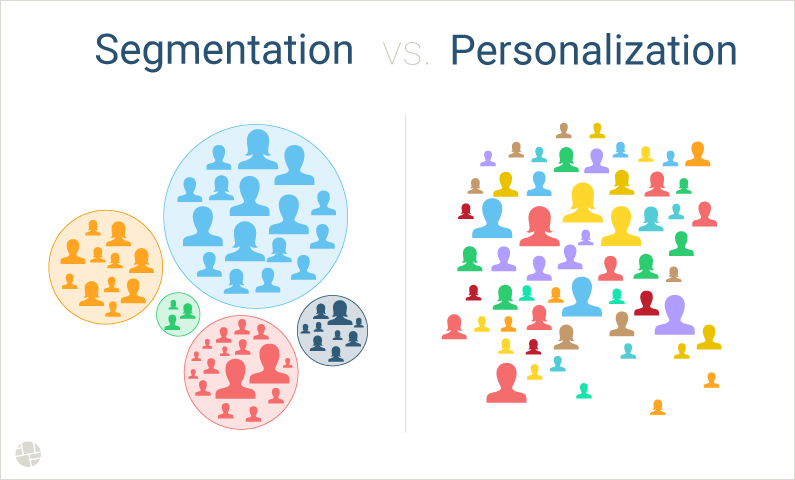 “segmentation is not personalization” –> ” Personalization is segmentation stripped to its roots”. Very interesting post Yaniv. Would you not argue to then segment further? Hi Matt. Yes, it may be a good thing to segment further, but not when looking to achieve true one-to-one personalization.